Jeanne Sauvé Foundation | Sauvé Encore! 2014 – It’s a wrap! Sauvé Encore! 2014 – It’s a wrap! It’s a wrap – the phrase used in film making to signal to actors and crew that filming of a particular scene, or film, has been successfully completed – seems particularly apt for the successful conclusion of the first session of Sauvé Encore! It was indeed a major production, ably directed by Ilona Dougherty assisted by Gioel Gioacchino, under the watchful eye of JSF producers Diane Sauvé, Jonathan Sas and Nancy Wright, and supervised by executive director Désirée McGraw, following a script developed by Simone Hanchet and Ilona. The international cast was led by 10 stars, Sauvé Fellows of 10 nationalities, representing 7 cohorts of Sauvé Scholars. Dawa from Bhutan (2005-06) is Bhutan Broadcasting Service’s award-winning broadcaster and anchor and In 2014, he was elected president of the Journalists Association of Bhutan. While in Montreal for Sauvé Encore!, he also was one of the panelists in the discussion following the Jeanne Sauvé Address. Gioel Gioacchino from Italy (2012-13) currently manages a Recrear research project in Cuba through a Youth Fund from the UN-Habitat. In the fall of 2013 she designed a course on ‘Youth Engagement in Community Development’ which she taught at Carleton University. 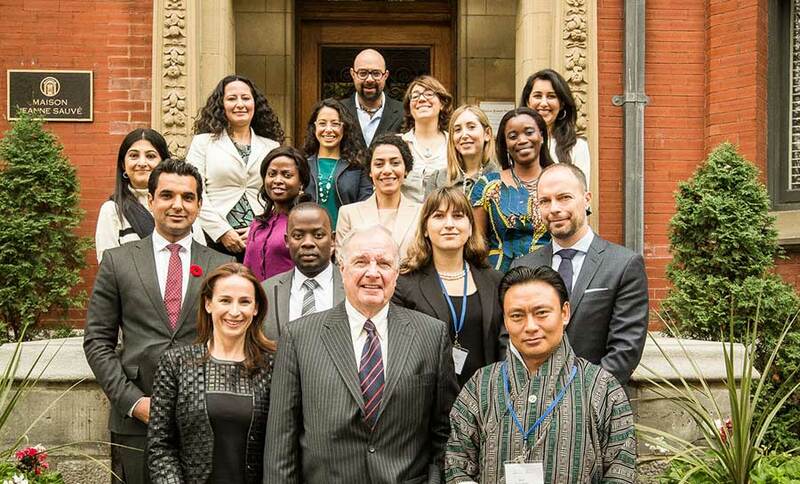 And in June 2014, she took part in expert meetings on Youth Engagement at UNESCO in Paris and on Youth Indicators in the post-2015 agenda at the Commonwealth Foundation in London. Idowu Ajibade from Nigeria (2008-9) is a postdoctoral Fellow at the Balsillie School of International Affairs in Waterloo, Ontario. Jola focuses her research on justice and accountability frameworks in climate change adaptation. In her work, she explores how individuals and societies respond to global environmental change and their different capacities for adaptation and transformation. Lilit Simonyan Ghougassian from Armenia (2010-11) As a Policy and Program Advisor at Ontario Public Service she continues to empower and contribute to meaningful programs that promote diversity and inclusion. She sits on the board of Recrear international youth organization and works with local non-profit organizations in Toronto. Maria Moreno from Paraguay (2011-12) A leader within her law firm and community, she continues her pro bono legal assistance to the environmental NGO she had previously worked with and has added another NGO that provides housing to the most marginalized members of the community. Mirwais Nahzat from Afghanistan (2009-10) As Vice Chancellor for Institutional Advancement at Kardan University, Afghanistan’s first and leading private university, Mirwais oversees the University’s strategic planning process, leadership development, international relations, and public affairs priorities, ensuring significant progress in all those areas. Najme Kishani Farahani from Iran (2012-13) In Tanzania and Kenya, Najme has been involved in the development of rich education programs for vulnerable groups including Somali women refugees in Kenya and children living in the informal settlements and slums. She also developed an education program for Somali women (refugees) in Kenya in order to integrate them within the host society. She is now taking these experiences back to Iran to launch an initiative using technology and mobile phones to address unmet educational needs such as conflict resolution, entrepreneurship and acceptance. Özlem ElgÜnTillman from Turkey, (2006-07) became the Associate Director of the Quantitative Reasoning Center at DePaul University in 2011. She continues to run this academic program whose goal is to enable students to become sophisticated and critical consumers of quantitative data and information, which, she reminds us, are a big part of the social, economic and political aspects of our society today. Sadia Rafiquddin from Canada/Pakistan (2011-12) Her work at GrantBook, a start-up B corp that helps grantmakers and their networks thrive in the digital era, is primarily in the area of global health, creating and building digital networks for clients such as Grand Challenges Canada and the Bill and Melinda Gates Foundation. In 2013, she created and oversaw the implementation of The Seva Fellowship. Sokhna Mame Bousso Ndiaye from Sénégal (2012-13) has launched the “Second Chance Academy” and the Solidarity Guarantee Fund that were her Sauvé projects, as well as a Social Shop that helps to sell products from program participants. A Young African Mandela Washington Fellow of 2014, Mame received a Public Leadership Certificate from Tulane University and public recognition from President Obama. There were guest appearances by marquee names who gave generously of their knowledge and leadership experience. The Right Honourable Paul Martin, Canada’s 21st Prime Minister, engaged in a wide-ranging dialogue with the group regarding issues from universal values to Aboriginal isues in Canada. Elizabeth May, Leader of the Green Party of Canada shared her thoughts on Canadian politics and environmental issues over dinner. Céline Galipeau, the distinguished foreign correspondent and Radio-Canada anchor who delivered the 2014 Jeanne Sauvé Address, spoke movingly about her experiences as a foreign correspondent over lunch and graciously answered dozens of questions about her career. The supporting cast of talented speakers, trainers, workshop leaders and panelists provided intensive and thoughtful sessions on topics designed to continue the evolution of the Fellows’ learning, focusing particularly on giving them the tools to amplify their impact on their respective contexts, communities and countries. Topics ranged from Public campaigns & advocacy to Presentation Skills, Being a Thought Leader and Cross-cultural communication. And there were active breaks with movement and dance artist, dance instructor, choreographer and yoga instructor, Daina Ashbee. The wrap party in the studio canteen – otherwise known as the Fellows’ beloved Sauvé House kitchen – was an emotional finale, featuring brief speeches from each participant during which they paid tribute to one another and the Sauvé Foundation past, present and future. Definitely better than most thank-yous at the Oscars! Still and video cameras were ever-present during the public moments, capturing thoughtful commentaries and joyous celebration of the social calendar.